Garmin HuntView Plus Maps provide 1:24K Topographic Mapping, BirdsEye Satellite Imagery and Hunting Data including species information. 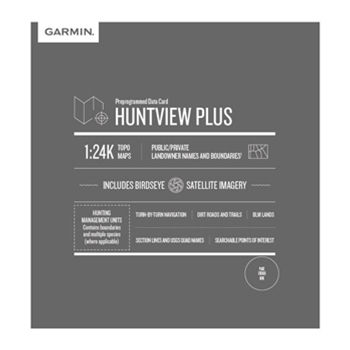 A perfect companion to your Garmin Handheld GPS, HuntView Plus charts provide public and private land types and boundaries as well as turn by turn routable trails and road data. Garmin's Huntview Plus Maps are State Specific, preloaded to an SD Card and build upon the 1:24K Topo Mapping by adding Birds Eye Satellite Imagery and provides important Hunting Data including routable roads, trail information, public/private land types and boundaries as well as Hunting Management units containing boundaries and multiple species where available. Garmin HuntView Plus Maps - CT, MA and R.I.
Garmin HuntView Plus Maps - DE, MD, N.J. and D.C.